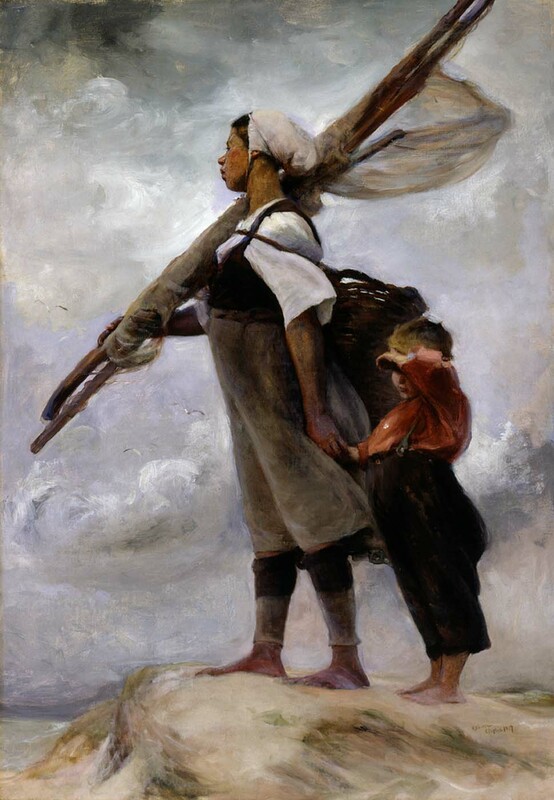 Elizabeth Nourse (1859–1938), Fisher Girl of Picardy (1889), oil on canvas, 118.7 x 82 cm, Smithsonian American Art Museum, Washington, DC. Wikimedia Commons. It’s often very hard to get more than a handful of images of paintings for any given woman painter, which prevents me from doing them justice in articles here. I’m delighted to say that this was not a problem with Elizabeth Nourse (1859–1938), although I still have the feeling that this and the next article show but a tiny fraction of her work. Nourse was born and brought up near Cincinnati, one of twin girls who were the youngest of a family of ten. Her artistic talents seem to have been recognised early, and at the age of only fifteen she started studying at what is now the Art Academy of Cincinnati. She was one of the first women to be admitted to its life classes, and after seven years of study there was offered a teaching position, which she declined. Although both her parents died in 1882, she was given financial support to continue her studies at the Art Students League in New York City, but the following year returned to work as a portraitist and interior decorator in Cincinnati. Elizabeth Nourse (1859–1938), Flock of Geese (c 1883), oil on panel, 65.8 x 142 cm, Smithsonian American Art Museum, Washington, DC. Wikimedia Commons. One of her earliest surviving paintings, though, is this unusual Flock of Geese from about 1883. Nourse spent her summers in the Appalachian Mountains, where she apparently concentrated on landscapes in watercolour. Elizabeth Nourse (1859–1938), Tennessee Woman (c 1885), oil on canvas, 94.6 x 64.8 cm, Private collection. The Athenaeum. 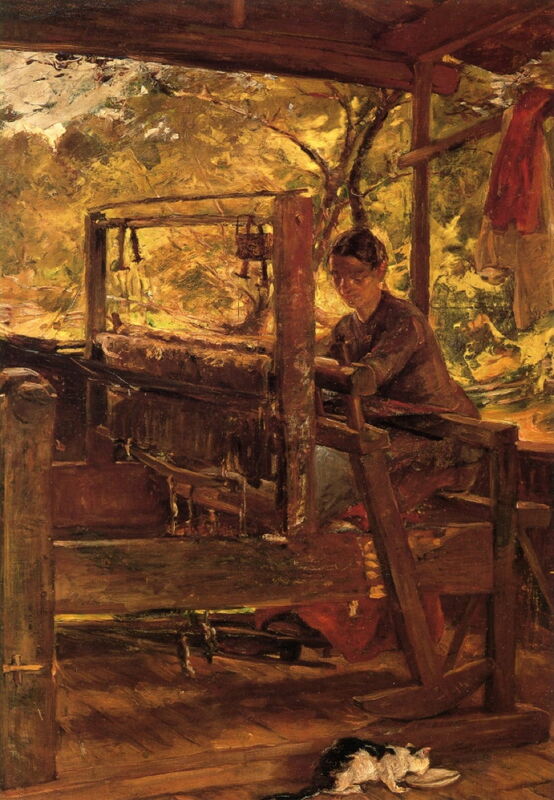 But the painting which I have found from this period of her career shows a Tennessee Woman (c 1885) weaving at a large loom, with her cat for company. In 1887, Nourse travelled to Paris with an older sister, where she settled and attended the Académie Julian, under Gustave Boulanger (a close friend of Jean-Léon Gérôme) and Jules Lefebvre, both of whom were renowned for their Salon style and rejection of Impressionism. Elizabeth Nourse (1859–1938), Woman with a Harp (1887), oil on canvas, dimensions not known, Cincinnati Art Museum, Cincinnati, OH. Image by Wmpearl, via Wikimedia Commons. 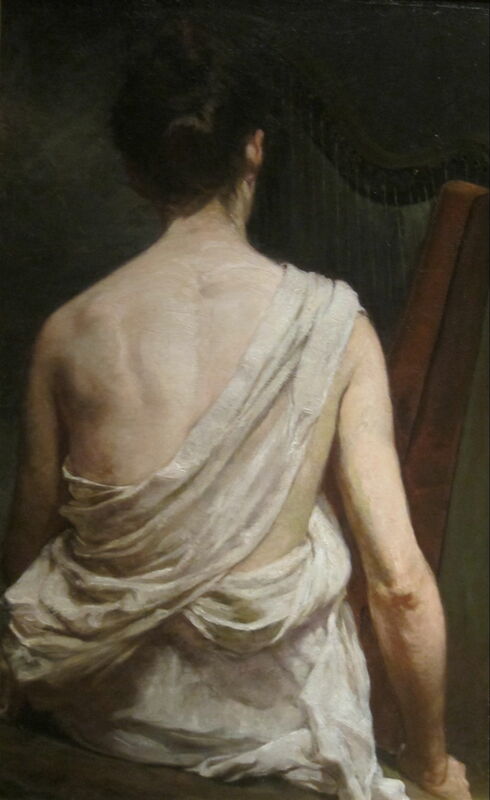 The influence of Boulanger and Lefebvre is visible in Nourse’s Woman with a Harp (1887), which is more traditional in its tonality and brushwork than her earlier work completed while still in the USA. 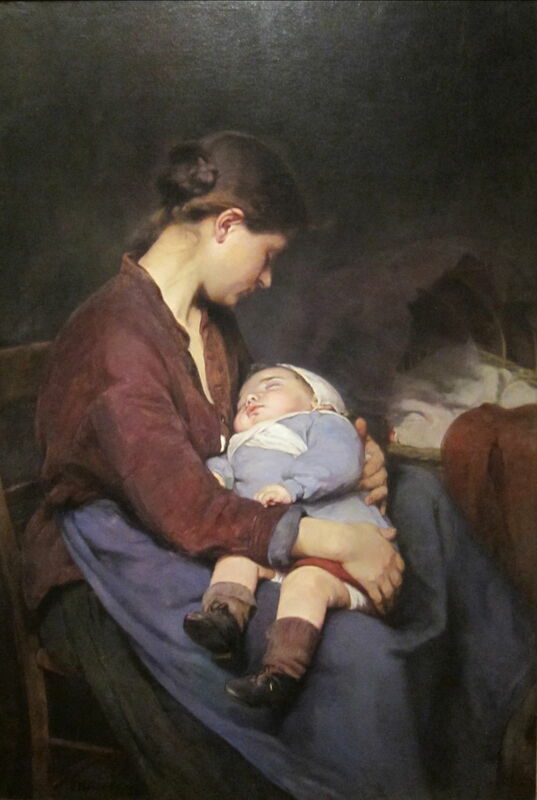 Elizabeth Nourse (1859–1938), The Mother (1888), oil on canvas, 115.6 x 81.3 cm, location not known. Image by Wmpearl, via Wikimedia Commons. Although Nourse seems never to have married, and lived with her sister until after the First World War, many of her portraits featured mothers and their children, as in The Mother from 1888. That same year, she exhibited her first paintings with the Societé Nationale des Artistes Français, and started to travel more widely through France and Europe. 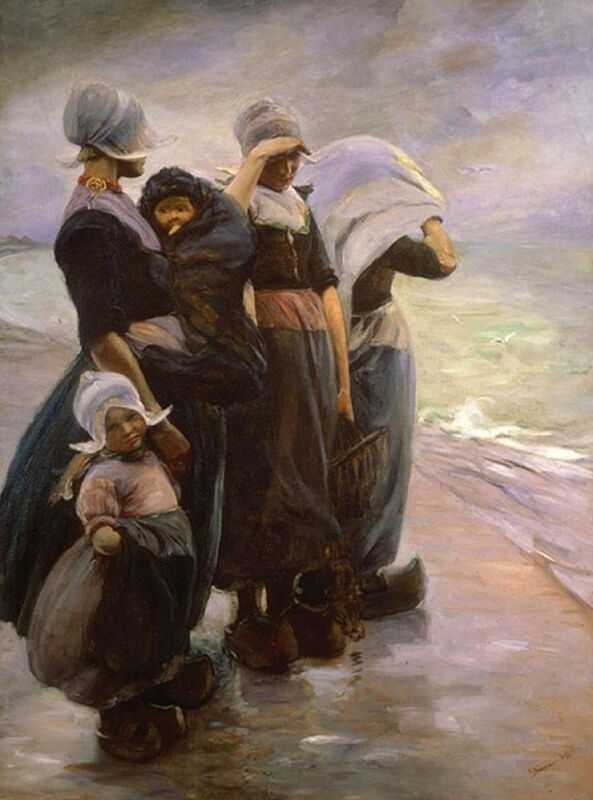 One of her early trips took her up to the Channel coast of France, where she painted this Fisher Girl of Picardy in 1889. It appears to have been influenced by the paintings of Winslow Homer made during his stay at Cullercoats in the north-east of England from 1881, although I am unsure whether she ever saw any of his works. It is also notable that her style has become much more modern and painterly. Elizabeth Nourse (1859–1938), The Church of Saint Francis of Assisi (1890), oil on canvas, 47 x 61 cm, Private collection. The Athenaeum. Nourse was born into a Catholic family, and appears to have remained a devout believer all her life. 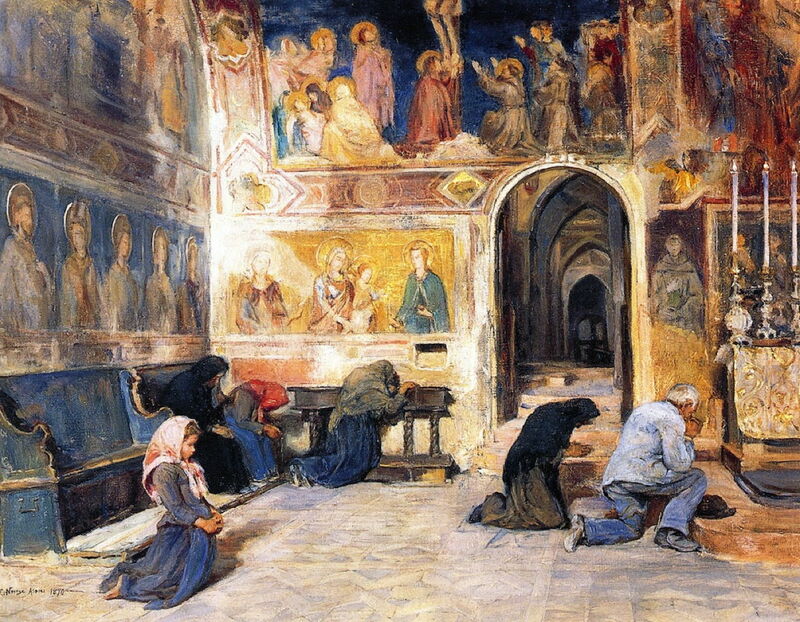 At this time, she seems to have visited central Italy, where she painted the superb frescoes in the Papal Basilica of Saint Francis of Assisi, in Assisi, in The Church of Saint Francis of Assisi from 1890. The focus of Nourse’s attention here is on the young girl kneeling in prayer at the left. 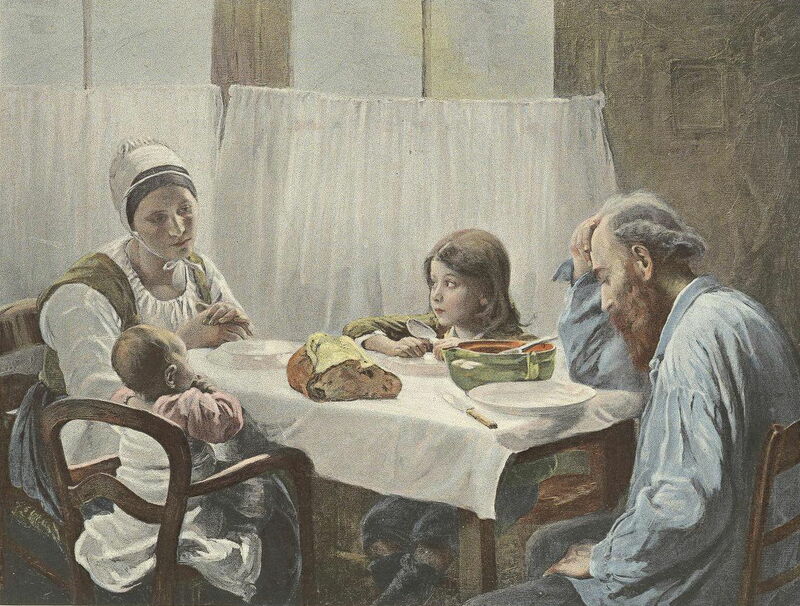 Elizabeth Nourse (1859–1938), The Family Meal (1891), engraving from Charles M. Kurtz, ‘Illustrations from the Art Gallery of the World’s Columbian Exposition’, Philadelphia, 1893, further details not known. Wikimedia Commons. Nourse also painted many social realist works, in which she looked at the lives of the rural poor. Among these is The Family Meal from 1891, which was awarded a medal at the World’s Columbian Exposition in Chicago in 1893, and is seen here as an engraving in its catalogue. Parents sit with their two young children at an almost bare table. Their meal consists of a pot of soup and the remains of a loaf of what appears to be stale bread. The older child looks expectantly at her mother, who stares despondently at the table. Her husband stares down at his empty bowl. Elizabeth Nourse (1859–1938), On the Dyke at Volendam (1892), media and dimensions not known, Private collection. Wikimedia Commons. In 1892, Nourse stayed in the artists’ colony at Volendam, to the north-east of Amsterdam in the Netherlands. Known as a picturesque fishing village, it had become popular with artists from across Europe during the late 1870s. On the Dyke at Volendam (1892) is what Winslow Homer might have painted had he visited a decade earlier, perhaps, with fisherwomen and their children looking out at the rough sea. 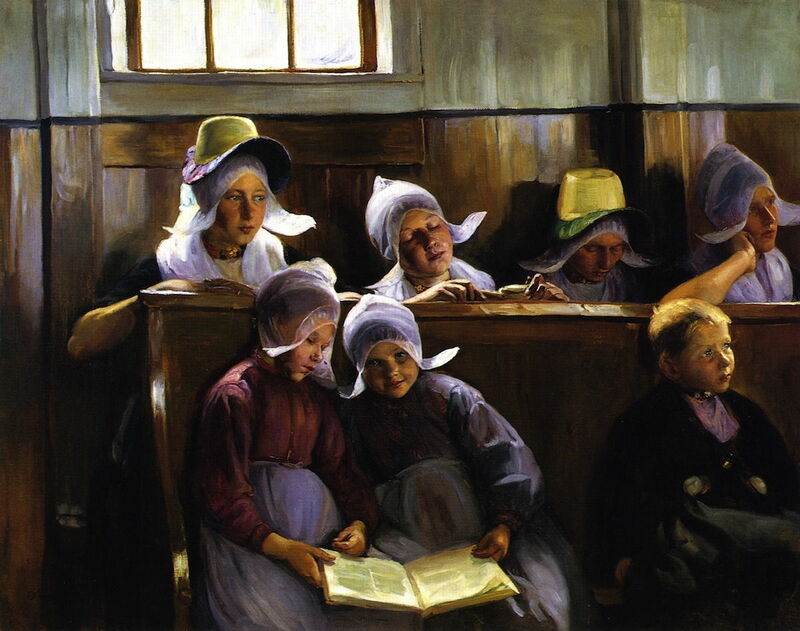 Elizabeth Nourse (1859–1938), In the Church at Volendam (1892), oil on canvas, 124.5 x 157.5 cm, Private collection. The Athenaeum. Nourse appears to have been particularly interested in local traditional dress, both here and in her travels in France. In the Church at Volendam (1892) is a delightful family portrait in Sunday best. It is precursor to her paintings in Brittany, which I will show in the second and concluding article on the work of Elizabeth Nourse. Posted in General, Life, Painting and tagged Boulanger, Homer, Lefebvre, naturalism, Nourse, painting, realism, women in art. Bookmark the permalink. Last Week on My Mac: Is XProtect dead, or about to be replaced?